Football has never exactly been a sport central to Vassar student life. As anyone who has walked around campus in the past few years knows, students even sell tee shirts advertising Vassar's non-existent football team with the words "Vassar Football: Undefeated Since 1865." And although some women's colleges, like Skidmore, provided football for the male veterans studying at the school after World War II, Vassar decided that football was either an inappropriate or an unnecessary amenity for its own fifty ex-servicemen students. Nor was football even considered with co-education. However, in the fall of 1962 the Vassar campus became impassioned by the sport - at least the "touch" version. Much to the amusement of the newspapers, Vassar students did not confine their games to low-profile on-campus scrimmages, but played against teams from other colleges as well. 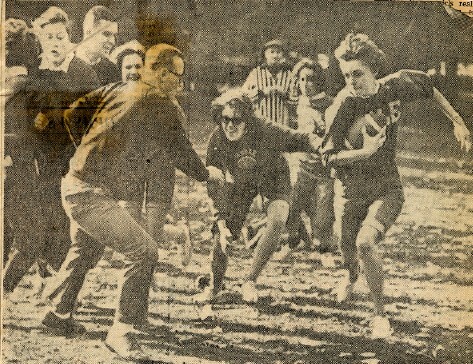 As no other women played touch football in 1962, the Vassar students were obliged to compete against men. Having arranged matches against clubs or fraternities from Yale, Siena, Lehigh, and Princeton during the fall of 1962, the girls played with a handicap: they usually earned more points for goals, were allowed to field more players, and were only "tackled" when one of the men managed to remove a sock from their back pockets. The men, conversely, were "tackled" when touched. Apparently, interest in football at Vassar dated from the beginning of the school year, when a group of seniors playing the game with the faculty's children realized how much fun the game could be. Josselyn and Noyes immediately organized dorm teams named, respectively, the "Joss Jocks," and the "Noyes Nymphs." The Senior Class put together a team of its own, called the "Senile Seniors." The approximately thirty interested girls managed to procure two coaches: Philosophy Professor Gary Vandeveer, the freshman Dean, and Bob Kluge, the son of the Plant Director. The Philadelphia News wrote a particularly colorful article that indulged in more speculation than fact, offering such commentary as: "Outstanding for the girls from Poughkeepsie was the speedy Dee Shell, who was a veritable reindeer in the flanker position. In fact the defensive back assigned to cover her was heard calling her 'deer.' And Susan Buck, a blonde linebacker of healthy dimensions, always seemed to be just where the ball carrier was. In fact, some observers noted it was as though the ball toters were running to her." 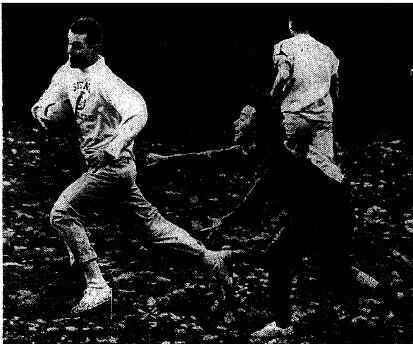 On October 10, 1962, these three teams played the first touch football games at Vassar. The game between Noyes and Josselyn resulted in a victory for the Jocks. Joss went on to play the Seniors, and was defeated in turn. While the Jocks only seem to have competed on campus, Noyes and the Seniors began to look elsewhere for new competition. On October 13, the Noyes Nymphs played against Yale, and lost, forty to zero. When the Seniors challenged the Yale team, however, they lost by the more respectable margin of eight to zero. After Yale, the Senile Seniors played against the Vassar male faculty and managed to play them to a draw, twelve to twelve. The Senile Seniors then turned to Siena, a men's college, in a game that received quite a bit of press from newspapers across the country. Pictures of Vassar girls running after Siena men were circulated everywhere from the New York Times to the St. Louis Post-Dispatch to the San Antonio Express. The New York Times described the events of the day: "In one of the most interesting games played anywhere this weekend, the Vassar girls curtsied to the men of Siena College… the men won by the embarrassingly slim but gentlemanly margin of 14-6 in Vassar's 'Wash Bowl.' Some of the dramatic highlights included huddles that resembled kaffeeklatsches, an immoderate amount of fumbling and offensive holding, one pass to the trees by the rattled Siena quarterback and one (unintentional?) tackle by a male halfback who said later, 'I guess I just lost my head....' In another gallant gesture, Siena agreed to this rules change: The men would consider themselves tackled by simply being touched, whereas Vassar would only be tackled when a male player could yank a sock from the hip pocket of a girl's blue jeans. Vassar responded ungratefully by tucking the socks in deeper as the game progressed..."
All the newspapers emphasized the fact that Vassar scored its only touchdown by bending the rules. Betsey Wilbur, the girl who scored the goal, apparently only made it to the goal line by transferring her sock from her right back pocket, where Siena expected it, to her left back pocket, and, as The Boston Recorder put it, "With this neat feminine 'strategy' (a word in gal lingo meaning 'how best to trick the fellas') Betsey scampered 30 yards to the goal line. So guess who won? No, not our heroines. But the collegians from Loudonville, N.Y. were gentlemen about it: They kept the margin of victory small, 14-6." So, according to newspaper opinion, not only were the Vassar girls unable to score any goals playing by the rules, but they scored as well as they did only because Siena did not want to discourage them. While all this publicity may have been of dubious value, both its quantity and tone reveal exactly how unusual Vassar's touch football team was; in 1962, a year that from all accounts marks a low point in interest in athletics at Vassar, thirty Vassar girls decided to start teams and challenge the men from the surrounding schools to play them. Touch football teams have dotted the intramural curriculum at Vassar ever since 1962. However, none have them have ever quite received the amount of press that the first teams did. Current teams might take pride in realizing, however, that they are following in the footsteps of athletes written about all over their country for their early and light-hearted incursion into a traditional and earnest masculine sport. "Hold That Line! Hold That Well-Built Line!" Philadelphia News 29 October 1962. Physical Education, Boxes 1-4, Special Collections, Vassar College Archives. Robertson, Nan. "Watch the Runner, Watch the Passer, Let's Go Team, Let's Go Vassar." New York Times 29 October 1962. Spiller, Jill. "Senile Seniors Play Ball, Vander Veer Will Coach." Miscellany News 10 October 1962. Spiller, Jill. "Times Reporter Cheers for VC at Wash Bowl." Miscellany News 31 October 1962. "Vassar Challenges Kennedys To Touch Football Contest." Poughkeepsie Journal 17 November 1962: 1. "Vassar Uses Hanky-Panky, Still Loses Grid Game." Baltimore Sun 29 October 1962.